You are here: Home / From My Experience / Baby seal looses his Mommy! Baby seal looses his Mommy! There are many things about float home living that are unique and wonderful and this is just one of them. 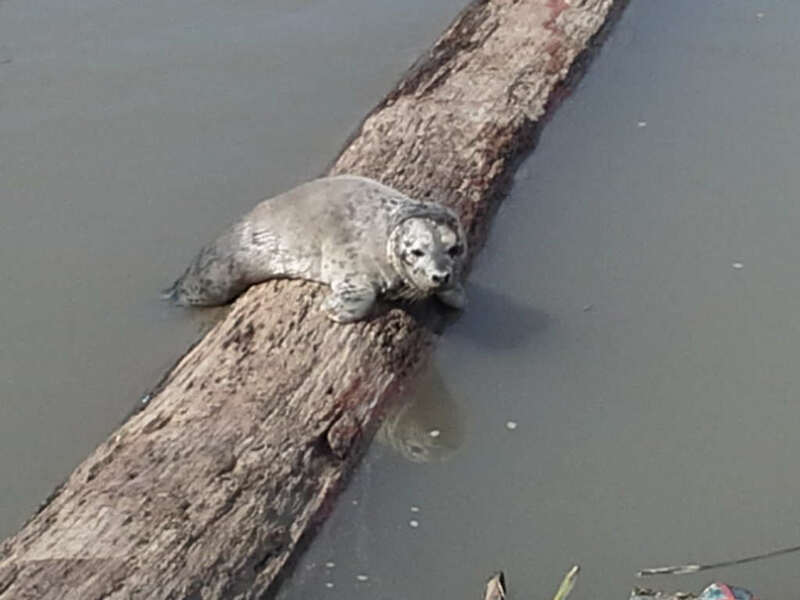 On July 8th a warm summer’s day, as I walked along our dock, I was greeted by a baby seal hanging from a log. He gave me that look that he was probably lost but I didn’t want to do anything if his Mother was around. He didn’t look distress but did look alone, but he spent the afternoon swimming, exploring and resting at Wes Del Marina and then swam over to Canoe Pass Village to look for his Mommy there. After spending a few lonely days sunning and meeting the neighbors, it became apparent that he had been abandoned so someone called the Marine Mammal Rescue. Each year, staff and volunteers at the Vancouver Aquarium rescue, rehabilitate and release over 150 harbour seal pups, like this baby seal now named Little Dipper, who have been separated from their mothers. Rescue Centre patients also include elephant seals, fur seals, sea otters, sea lions, whales, porpoises and adult harbour seals. Also, the aquarium keeps track of all their rescues and have set up a patient list on their website so you can get an update on what animals they have, where they were found, the reason for the rescue and when they are released back to their natural habitat. The Vancouver Aquarium Marine Mammal Rescue Centre operates largely on donations and is the only rescue hospital of its kind in Canada.